Ojo de Perdiz is a simple guesthouse located in a remote and starkly beautiful part of Boliva. Just to the south of Salar de Uyuni, on the edge of the Siloli desert is this small collection of thatch cabins. They are simple and fairly basic but comfortable, each with a private bathroom and heating to ward off the chilly evenings. The decor is rustic in style, with adobe walls and local textiles in rich natural tones adding the finishing touch. The restaurant serves wholesome food in this remote location, guests can enjoy their dining experience while admiring the dramatic views through the panoramic windows. What Ojo de Perdiz may lack in luxury it more than makes up for in atmosphere and breathtaking views, literally in the middle of nowhere. Open: Ojo de Perdiz is open all year round. Rooms: There are 30 simple and comfortable en-suite rooms. The bathrooms have hot water showers. 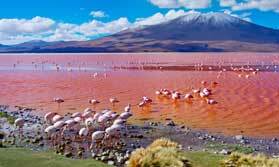 Activities: Visit the famous Uyuni salt flats, the largest in the world. Dining: Good, wholesome meals are served in the restaurant. Communication: There is no Wi-Fi or mobile coverage.